An Illustrated Workshop Guide to help you create your own designer Art-Toys. Written & Illustrated by Matt Jones 2015. - Learn the Trade Secrets from a Real Art-Toy Designer. - Train to become a Master Plastik Surgeon! - Create your very own resin cast Designer Figures! This workshop guide is a “Level .1.” handbook, which means that it was written especially for beginners. You don’t have to know anything at all about resin casting or the toy industry. All you need to get started is simply an idea, and this handbook will show you how to turn that idea into a reality. and illustrations. 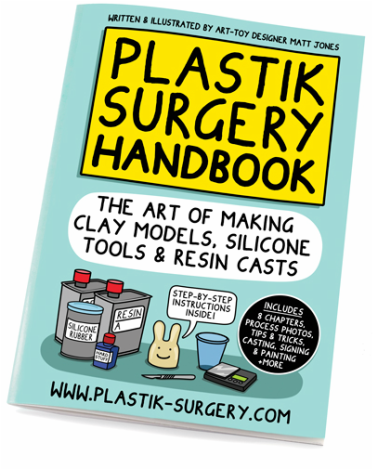 Covering all the basics of the “one part” silicone tooling method from start to finish, this book will have you up and running in no time, and you’ll soon be on your way to creating/casting your own custom designer figures! - Comes with a clear protective wallet. - £12 un-signed, £15 Signed by matt with a fun doodle. - Packed in a hard backed envelope with free stickers. - Worldwide tracked shipping @ £6 dispached from Germany.